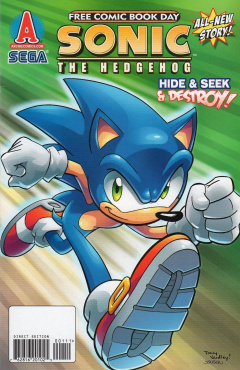 "Sonic the Hedgehog FCBD 2010"
Sonic the Hedgehog FCBD2010 is Sonic's 4th FCBD issue. The issue only contains one story Hide & Seek & DESTROY! Hide & Seek & DESTROY! Continued from either issue 211 or issue 212. The story begins with Sonic looking at the Egg Dome and starts going through the ruins of the city while he wonders why Eggman focused on this specific building for that little incident. Meanwhile Eggman sees Sonic coming on a monitor and begins monologuing basically saying "you'll wont't find anything again" and will determine his own return to harass the hedgehog. Snively then enters the room to break the mood by pointing out his monologuing. Eggman then starts yelling at Snively about why he's not working in the engine room and Snively says he's ahead of schedule and is taking a quick lunch break. Sonic then enters the Egg Dome unaware that something is watching him. Then Sonic starts running through the halls while he remembers recent events such as That Little Incident, Monkey Kong Appearing and The Iron Queen Taking Over. After that he reaches a dead end and he turns back only to see the thing that was looking at him earlier and says basically "How's going, i'm glad i found you so i won't miss the chance to kill you." and then the fight begins. Eggman is confused what it's but Snively recognizes it as the Krudzu first (and last) seen all the way back in issue 1. He goes on to state that the original Robotnik made it (technically it was a swatbot) and worked on it. (presumably before his death). It had survived the nukes as one root was deep underground and it eventually grew and combine with old robot parts. Eggman is fascinated by this and Sonic is thrilled by this as he remembers the old days but he knows it has to end so he tries to destroy it by spindashing it however it reassembles itself and goes all out with Sonic stating if it can survive a nuke then a spindash won't destroy it. Snively cheers however it's short lived because Eggman wants to destroy it as he wants to defeat Sonic with his own inventions and not the old Robotnik's. He sends the robot (full of water btw) and destroys the machine with it with Sonic confused about this move but he's left exhausted and so he leaves stating to him he'll return. The story ends with Eggman monologuing again saying when he does truly return "it'll be a memorable one." This story either takes place before or after 212. When Eggman says it'll be a memorable one it's probably referencing issue 224. The parts on the Krudzu include the of a Caterkiller (possibly the first one), the head of a Swatbot and the claw of a Crabmeat. This page was last edited on 17 October 2018, at 06:45.